From Jenner north to Fort Bragg, the wintertime drama along the California North Coast can make for romantic weekends to remember. November through March, low-pressure systems roll in off the Pacific, one after another, and the tumultuous surf is thrilling to watch. Because this is California, it’s also common for blue skies to break through between tempests, and that is a magical time, when the sun glints on dripping evergreen branches and the beaches are treasure chests of driftwood, shells, and discoveries washed up by the pounding waves. Some travelers toast their tootsies and sip hot toddies by roaring fireplaces in snug bed-and-breakfast inns, while stalwart souls trod the windy beaches, breathing in the invigorating ozone from the raucous breakers. All along the North Coast, clifftops and easy-access parking areas afford vistas of the smashing surf, and many restaurants and bars have ocean views. A good way to start a coastal jaunt up Highway 1 is with breakfast at Coast Kitchen at Timber Cove Resort, a newly refurbished hotel and restaurant in a towering circa-1960, Frank Lloyd Wright-inspired, redwood and stone building. From the restaurant, the outdoor fire pit and from nearly every one of the forty-six guestrooms, you can see miles down the craggy coastline––sunsets are legendary. Guests watch the waves from their soaking tubs and their fireplaces, while listening to vintage LPs on in-room record players (really). Libations are taken by a massive stone fireplace in the soaring lobby, and when there’s a break in the weather, you’ll see people heading for the deck on the east side of the hotel, where the half-mile-across cove turns into a vast, foamy, photogenic expanse of stormy surf. Up the road, the shelter at the blufftop visitor’s center at Salt Point State Park is another good spot from which to watch walls of churning waves; walking trails from here connect to the four roiling coves below. One of the most exciting places to be during a storm is on the 322-foot-long, wheelchair-accessible pier at Point Arena. Rising in force a quarter mile out, waves rush onto the little black-pebble beach and blast up over the boulders shielding the parking lot. Fisherman huddle at the end of the pier, tossing their long lines out for rockfish and lingcod. When it’s too rough to fish, they retreat to old-fashioned bar in the Pier Chowder House and Tap Room at the end of the pier, along with tourists and locals, for steaming bowls of clams and mugs of Eel River Brewing Company’s IPA. The restaurant is lined with windows and with photos of storms past when trawlers went aground, and when the pier was smashed to pieces in 1983. Even in the worst weather, you can park at the foot of the 115-foot-tall Point Arena Lighthouse Station, the tallest lighthouse on the West Coast, and climb the tower on a tour to see a 360-degree view of raging seas. A separate gift shop has a wonderful museum of shipping artifacts and photos of early days of sailing and logging, and a spectacular 666-prism Fresnel lens. Families love the handful of rental homes here, each complete with wood-burning fireplaces, three bedrooms and full kitchens. At the village of Elk Cove, once a rip-roaring loggers’ town, Greenwood Creek State Beach is a favorite driftwood-hunters destination. Herons stalk around in the reedy stream that runs into the sea, whales cruise along right offshore, and above it all, the Elk Cove Inn claims the hillside with Craftsman-era, oceanfront lodges. 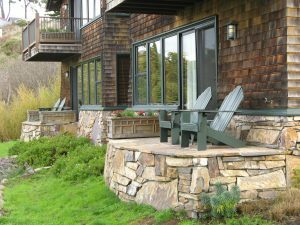 Lounge chairs and a wood stove warm guests in the Bavarian Cottage, where windows frame the stream, the beach, the monumental Gunderson Rock surrounded by stormy seas. Loathe to leave their fireplaces and poufy down comforters, guests from the sixteen rooms and suites wander down for champagne breakfasts in the glass-enclosed dining room. Three nights a week, “Chez Marie” also offers French-style dinners here, which comes in handy, as only one other eatery is found in town––Bridget Dolan’s Pub. There’s no place better to hunker down and ride out the storms than at Little River Inn, where most rooms sport ocean views and fireplaces. When rain beats against the windows, there’s no need to leave the inn with its on-site fine dining, and water views from Ole’s Whale Watch bar, where locals gather to swap yarns. 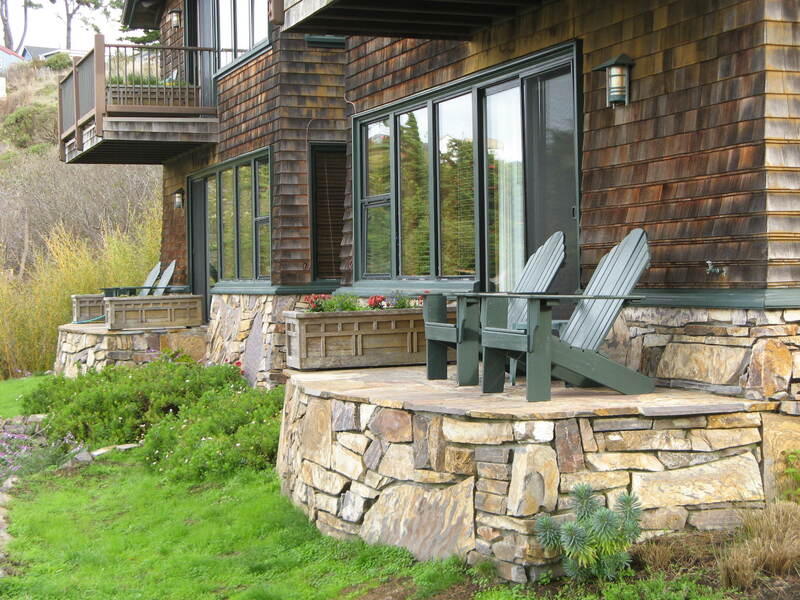 Timber Cove Resort: 21780 Highway 1, Jenner, (707) 847-3231. Elk Cove Inn & Spa: 6300 South Highway 1, Elk, (800) 275-2967. 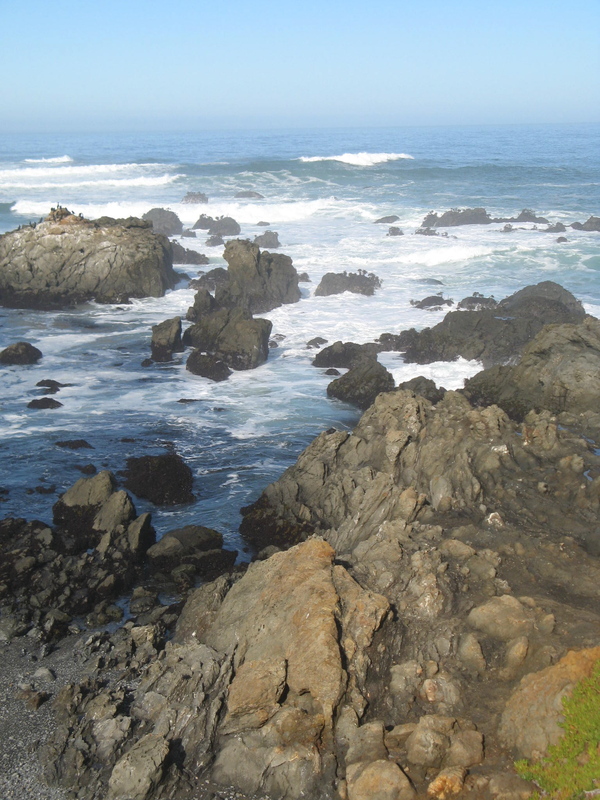 Sea Ranch Lodge: 60 Sea Walk Drive, Sea Ranch, (707) 785-2371. Sea Rock Inn: 11101 Lansing Street, Mendocino, (800) 906-0926. Inn at Newport Ranch: 31502 North Highway 1, Fort Bragg, (707) 962-4818. Coast Kitchen at Timber Cove Resort: 21780 Highway 1, Jenner, (800) 987-8319. Little River Inn: 7901 North Highway 1, Little River, (707) 937-5942. Flow: 45040 Main Street, Mendocino, (707) 937-3569. When icy seas boil at the foot of the headlands in the Victorian town of Mendocino, a window table in the bar of the Mendocino Hotel is a cozy spot for overlooking the foaming waves as they funnel into the Big River and crash against the craggy, forested bluff on the far side. In the bar, a low fire crackles in the 100-year-old, cast iron Dutch fireplace, a curious design combination of Romanesque and Art Nouveau. Intrepid storm-seekers head for the trails along the headlands (trail maps from the Mendocino Visitors’ Center in the yellow house), and there are seaview parking areas on the west side of town. Those in the know stop at the cypress grove, where they can walk among the dark, windblown trees to a perch right over a pounding cove; this is a popular location for small weddings. 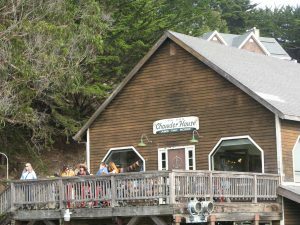 If the weather’s just too crazy in Mendocino, you can still wave-watch right from Main Street, while relaxing on window seats at Gallery Bookshop, or peering through a line-up of telescopes aimed out to sea from the Out of This World science store. At the top of an old water tower, Flow restaurant has a birds-eye-view deck and glassed-in dining room that looks right across the headlands to the wide Pacific horizon. 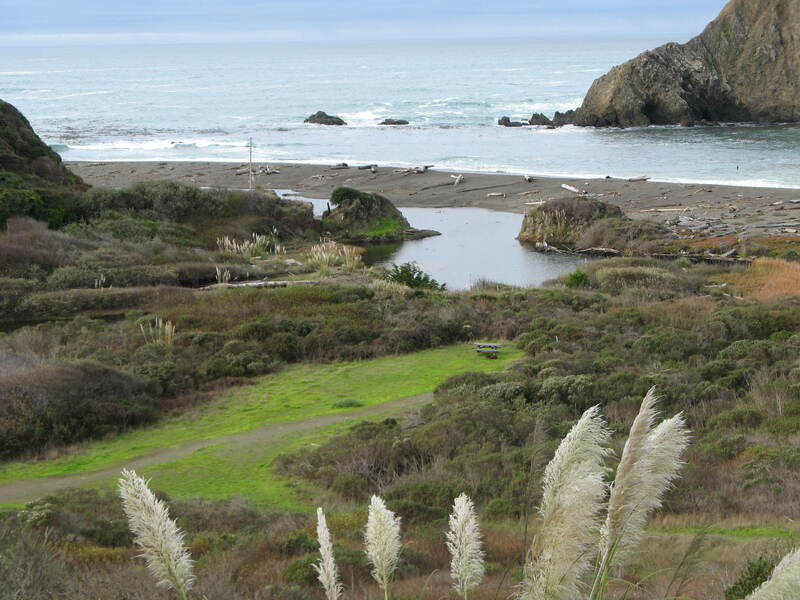 On the south end of Fort Bragg, don your Sou’wester and rain boots for a walk through the Mendocino Coast Botanical Gardens, the only oceanfront botanical garden in the country. On these forty-seven acres is an enchanted kingdom of magnificent trees and blooming gardens, where on rainy days, visitors head along the trail to the Cliff House, a sheltered cottage on a hillside above waves thundering against jagged pinnacles and across the cove beyond––part of the California Coastal National Monument. Keep your eyes peeled for sea lions as they “haul out” onto the rocks, and for whirls of murres, pelicans, cormorants, and gulls. The Captain’s Quarters at the Inn at Newport Ranch, just north of Fort Bragg. When the sun begins to sink into the horizon, tuckered travelers arrive at the Inn at Newport Ranch, a Shangri-la on 2,500 acres of forest, meadow and oceanfront just north of Fort Bragg. In the main lodge, a snapping fire in the massive boulder-framed fireplace is the place to enjoy happy hour wine and savories, and sunsets over the sea, before retiring to nautical-inspired guestrooms above. Several more rooms and suites, and the spa, are in the adjacent Redwood House, where a unique indoor forest of redwood trunks is startling, to say the least. A rooftop hot tub, fireplaces, Jacuzzi tubs, and Craftsman-style antique wood elements create coziness and comfort throughout the seven-room inn and the spa, which has it’s own hideaway lounge. 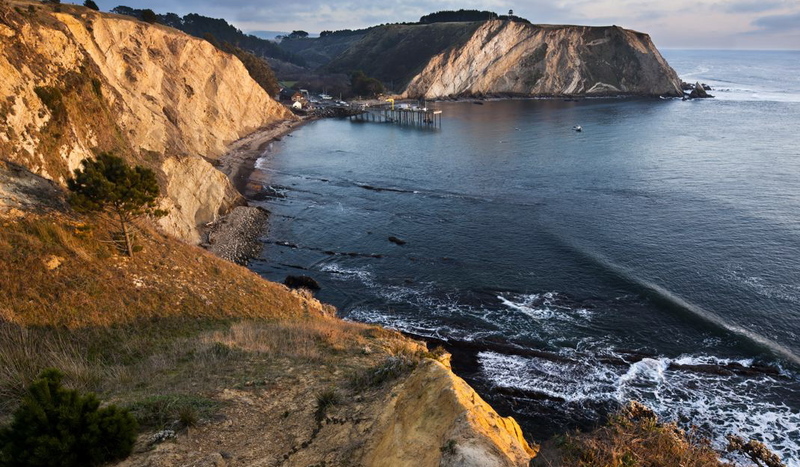 From the narrow, clifftop point in front of the inn, in the 1800s, redwood logs were lowered to masted schooners that sailed to and from the rising city of San Francisco. Today, wedding parties parade out to what is now known as “Celebration Point” for ceremonies in sight of thirty miles of rugged coastline. If your travel budget doesn’t stretch to a bed and breakfast inn in Fort Bragg, beautiful, secluded RV campgrounds await at nearby MacKerricher State Park, a former Native American reservation and logging camp. A wheelchair and stroller-accessible boardwalk leads to Laguna Point, where the marine scene is miles of surf-fringed Humboldt County coastline. Whether in a cozy cottage, a friendly pub or a campground, far from the slings and arrows of everyday life, winter storm watchers contemplate the tempestuous moods of an ocean that seems to stretch to the ends of the earth. Where is your favorite stormwatching perch along the California North Coast?